Vivacious, cleft flowers give this Geranium arrangement a burst of color. Rounded green and brown rimmed leaves are handcrafted with authentic detail. 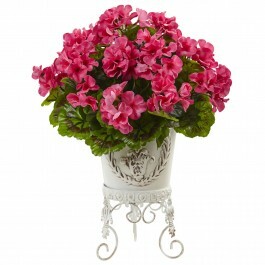 The metal white planter gives the arrangement an antique look. Place by a fireplace or patio to complete your enchanting living space. H: 9.5 In. W: 6 In. D: 6 In.